Ko je ciljna grupa korisnika? Šta su pozitivni argumenti plutanja? In our rushing, overworked world, means of regenerating the tired body and mind and restoring our energy have been the focus of increasing attention. People have increasingly less time available for rest and recharging. Consequently, there is growing demand for services that offer fast and effective relaxation and rest in our own environment. The plethora of massage parlours, gyms and yoga centres cropping up everywhere serve this demand. In our world, there is practically no way to escape from the outside world’s stimuli, its noise; not even in our own homes. A fundamental problem of our urban lifestyles is noise and stimulus overload. Floatation appeared on the market in the recent past, offering a means of relaxation that is based the fundamentals of human existence: a full hour of total silence and relaxation in a state of weightlessness. Floatation is gaining ground worldwide, especially among those leading busy, stressful lives, athletes and anyone seeking time-efficient, complex relaxation. The Float SPA partner network represents an innovative answer for this particular market segment. The floatation cabin developed by us is currently the most cutting-edge product on the market, providing the experience of weightless floatation. We offer the floatation cabin in the context of a partner network, paired with an exclusive corporate design and interior design concept, and an elaborate salon network. A team of experts helped us create and build our network over a period of several years, including psychologists, market researchers, designers, interior designers and business consultants. Based on our research and surveys, we have devised a sleek, but still natural environment defying trends for the service. The environment exudes a sense of calm perfectly suited to a “bath of silence” in our noisy world. International franchise and partner networks are increasingly successful and recognised worldwide. Partners are handed an elaborate business model that has already been tried and tested, sparing them the need to experiment. The network plans everything in a customised and accurate manner for each partner, who receives a tried and tested solution to every potential problem. We have no intention of charging our partners a monthly or even annual network fee. Our network is based on one-time lump sum payment upon entry, which includes the comprehensive interior design, graphic design and technical design of your unit, and usage rights of the machinery and the Float SPA name. Our common objective is a well-run, viable business offering profitable conditions of operation for all. Floatation offers complex regeneration and a quick antidote to the effects of stress, and should therefore form part of everyone’s health and fitness regimen. 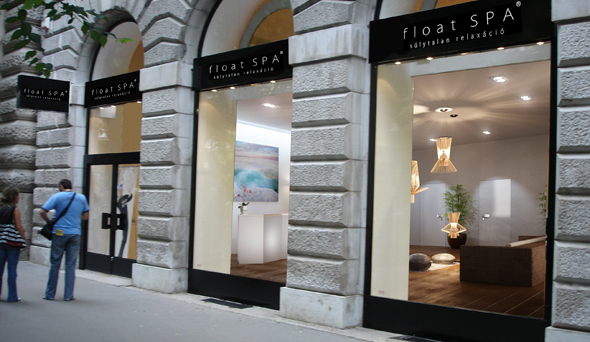 We not only manufacture the floatation cabin, but also create the comprehensive design and installation concept for the Float SPA. We can also help you to find the perfect location for your salon. Float SPA know how, comprising the design guide, promotional graphic material (banners, posters, with open source, editable graphic files). Our short films and advertisements presenting our floatation cabin and network for PR purposes. The distribution rights for the products sold at our partner locations, which are custom-manufactured or distributed exclusively by our network. They include dietary supplement packages, cosmetics, fragrances and other accessory products. We prepare full 3D visualisations, technical documentation and material specifications for your designed unit, simplifying the planning process for your project. We provide training for your staff, teaching them the operation and maintenance of the floatation cabin. The key to the success of our partner network lies in our experience and sound professional background, coupled with continuous service and quality. Clients become acquainted with the brand, trust the brand and return to it. Float SPA Kft. provides centralised marketing and management strategy. We provide a complete concept and business plan, advertising space and guidance, elaborated with a large team of experts. We provide territorial coverage and competition-free operation to our partners. We hope our presentation has sparked your interest.